For prototype teams in the NEO Endurance Series, this season was a bit like going to school as they learned the new-to-iRacing P1 machinery. And in this class, one team stood out as the model students. Thrustmaster Mivano Racing’s #3 entry aced their initial tests without penalty, and while their classmates occasionally stumbled when faced with difficult material or just trying to keep pace, Mivano’s greatest errors were attempting to take off before the end at Interlagos and having a comeback attempt at Spa come up just seconds short. 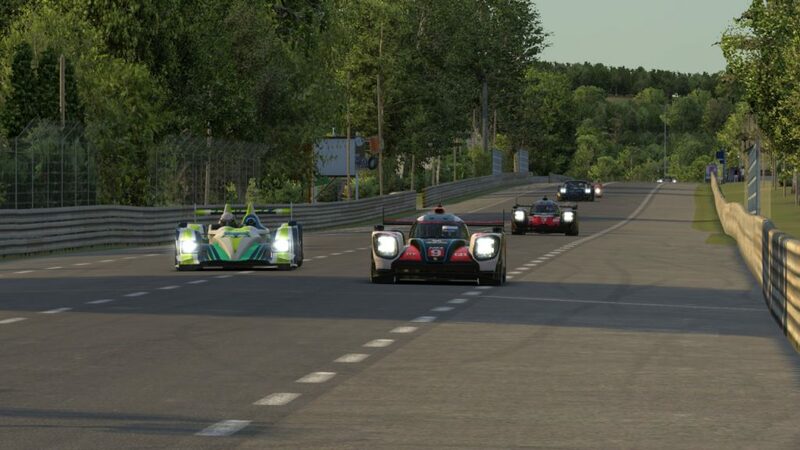 Well on their way to a championship, their final test came in last weekend’s RaceSpot 24 Hours of Le Mans, and they weren’t content to settle for a barely passing grade; they wanted to win. And in a race that would play to their season-long strengths of speed, mistake-free driving, and traffic mastery, who could blame them? The start by Mivano and Marcus Hamilton was solid, but their biggest assist came from contact between the two cars immediately behind them, SimRC.de and Wyvern Racing, in the Ford chicane headed to the green flag. Wyvern and Chimera battle in the early hours at Le Mans. After the first lap, Hamilton had a nearly three-second lead over his teammate Maxime Brient in the #4 Porsche. As the opening stint continued and the P1s made their first trips through traffic, that gap slowly decreased to just one second ahead of new second-place runner Dominik Färber from AVA Vervatic. The first round of pit stops saw a mix of strategies, both in terms of timing and tasks on pit road. Hamilton, Brient, and a handful of others pitted after 11 laps for tires and fuel, and a shorter fill by Race Clutch and Porsche Basel by Sorg Rennsport eSports helped them leapfrog Mivano after their service was complete. Färber stretched his tank an extra lap and took no tires in his stop, which gave him a comfortable 14-second lead as the second stint commenced. However, a mid-stint spin and a slower pace on old tires narrowed that gap to less than three seconds before stops began again. This time, Färber changed tires while his opponents did not, handing the lead to Sorg’s Mike Nürnberg and, later in the third stint, Race Clutch’s Richard Arnaud. SimRC leads GT traffic through the second chicane. While the early-race position swapping up front was happening, Mivano seemed content to ride comfortably inside the top four and wait for the race to come to them. 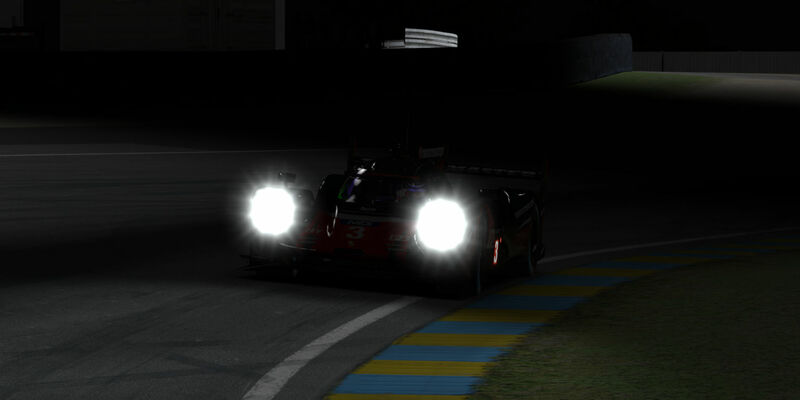 After several more hours of trading the lead with Sorg and Race Clutch, Tommaso Carlà finally regained the lead as the race entered the nighttime hours. That was their time to shine, as they led 305 consecutive laps, including a quadruple stint from Patrick Schneider in his season-five debut, and maintained a lead that fluctuated between just a few seconds and nearly three minutes. Behind them, a number of their biggest rivals from the opening hours encountered problems that dropped them out of contention for the win. On lap 55, Race Clutch’s Balazs Remenyik crashed out of the lead due to an apparent technical failure, and a later crash in the Porsche Curves put the Spa winners in the pits for extended repairs. AVA also saw its podium run end with contact for Färber on lap 43. While the team was able to make repairs and Michael Schwanzl drove the #23 car back inside the top five, they faded in the second half of the race before retiring with two hours to go. Early issues also affected several other P1 runners. Just five laps into the race, Torrent Motorsports blew their engine on the Mulsanne straight, and after a tow to the pits and more than half an hour of repairs, they re-joined the race many laps down. 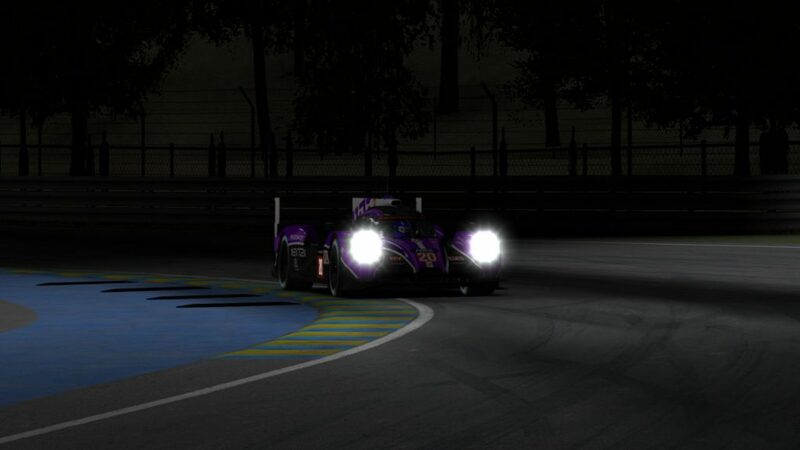 Torrent’s repaired car heads down the Mulsanne after losing time early repairing damage. Odox Motorsport had a more terminal problem when they crashed into Team Heusinkveld’s invited P2 entry on lap 62, putting the #14 car out of the race. The sole P1-class invitees from ASTRO Gaming Altus Esports had a strong showing early in the 24, briefly putting their Audi R18 e-tron quattro inside the top four. However, issues overnight also ended their race. Problems for those contenders helped elevate a few endurance-minded teams up the running order. After Wyvern’s starting-line incident and a subsequent pit stop that dropped them to the back, they made their way into the top five by the six-hour mark. A hectic start among the mid-field for VRTeRacing was also followed by a rise into top-five contention. And SimatoK eSport, which hasn’t had the pace to match the frontrunners this season but has reached the finish line in every race, used that survivability to steadily rise up through the ranks. At the front, a warming track saw Mivano’s advantage shrink over its closest rival, SimRC. Michael Mittner broke the #3 car’s streak of laps led when he made a pass on lap 395, and while a pit stop soon handed it right back to Hamilton, it was clear that Mivano couldn’t take its foot off the gas in the closing hours. Mivano narrowly leads SimRC late in the race. After the final pit stops, Mivano’s Carlà held a 25-second lead, and while it decreased to under 11 seconds during a celebratory run to the checkered flag, the end result was the same as it’s been for most of the season: Mivano in victory lane. This Mivano P1 squad became the fourth team to win five races in a season, joining Pure Racing Team’s GTS team in season three and prototype team in season four, as well as Mivano’s own GT team from season two. As a member of two of those teams, Carlà sits firmly among NEO’s most decorated drivers with a claim as one of the series’ all-time greats, and certainly one of the most underrated. His teammates Hamilton and Frederic Evers can finally call themselves NEO champions, crossing that long-awaited accomplishment off their to-do lists. Given Mivano’s dominance, there was little shame in finishing second to them in a race or in points this season. 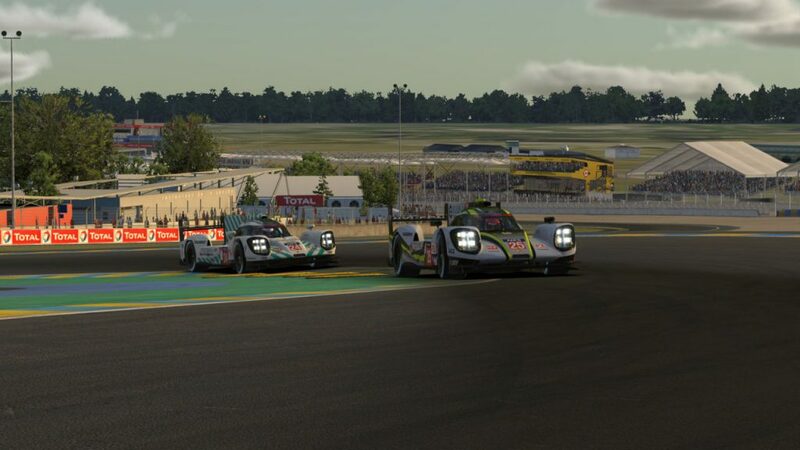 At Le Mans, that distinction went to SimRC, while in the standings, the runner-up spot belongs to Sorg, who completed the podium in the season finale. Wyvern held onto fourth place, tying their best result of the season, and VRT easily earned its season best in fifth after solid drives from the foursome of Jason DeVriese, Joseph Fabian, Dylan Ian Mann, and Dylan Scrivens. VRT races through the night en route to a top-five finish. The fight for the final two automatic invitations came down to the sixth through eighth-place finishers. 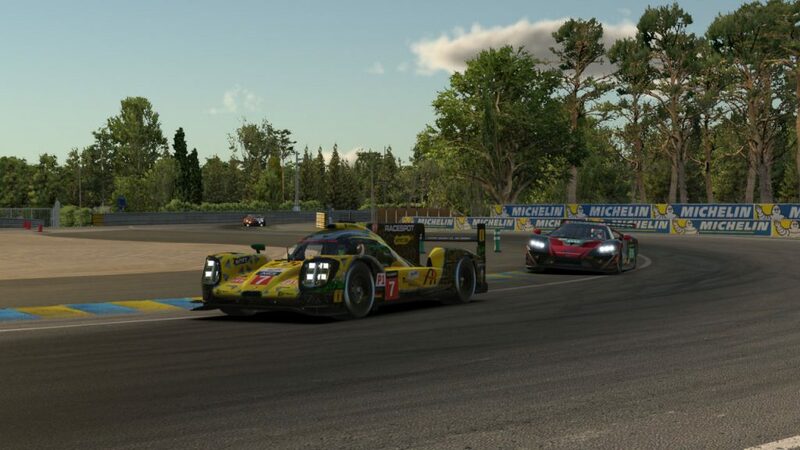 UI1-Positive SimRacing entered the race seventh in points, and a P8 finish at Le Mans was enough for them to keep that spot. Virtual Motorsport and SimatoK both passed no-show MSI eSports in the standings, but there was only enough room for one of them in the top eight. Although SimatoK finished the race in sixth, two laps ahead of Virtual Motorsport on the track, the Audi team ended up one point ahead in the standings, rewarding the season-long underdogs with an invitation to season six. 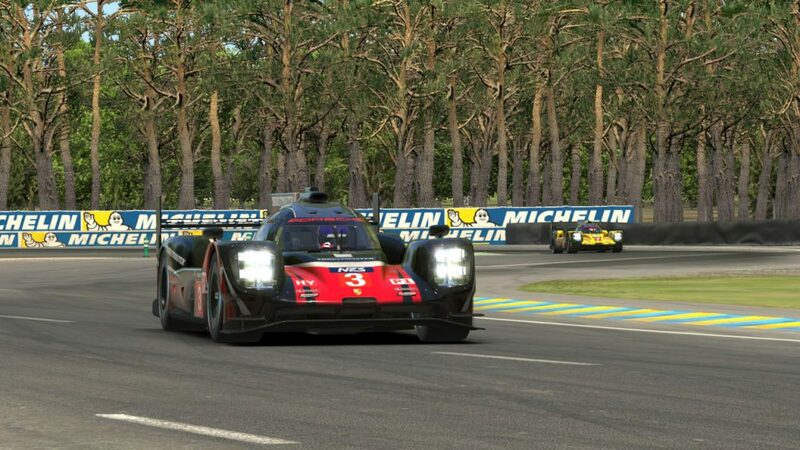 The Le Mans race encapsulated the frustrating season for Team Chimera. Despite showing top-five speed at times, a combination of contact and penalties with a dash of controversy in the protest rulings doomed them to ninth place. Perhaps the biggest heartbreak among the P1 field belonged to Mivano’s #4 team. Running third with just six hours to go, Philipp Baur was clipped by a GT car in Maison Blanche, sending him hard into the outside wall and back to the pits with heavy damage. While they watched their teammates celebrate a win and a championship, they were left to finish tenth in the race and sixth in the standings. Teams plagued by early problems rounded out the results. Race Clutch was 18 laps down in eleventh, Torrent was 21 laps down in twelfth, and AVA, Altus, and Odox all failed to finish. It was a disappointing end to the season for some teams, a satisfying one for others who snagged a top-eight finish, and a triumphant one for the winners. The checkered flag at Le Mans might mean that class is dismissed, but Mivano’s rivals may consider heading to summer school if they hope to narrow the gap to the star students next season. After all, one of NEO’s most dominant champions ever shows no signs of slowing down.